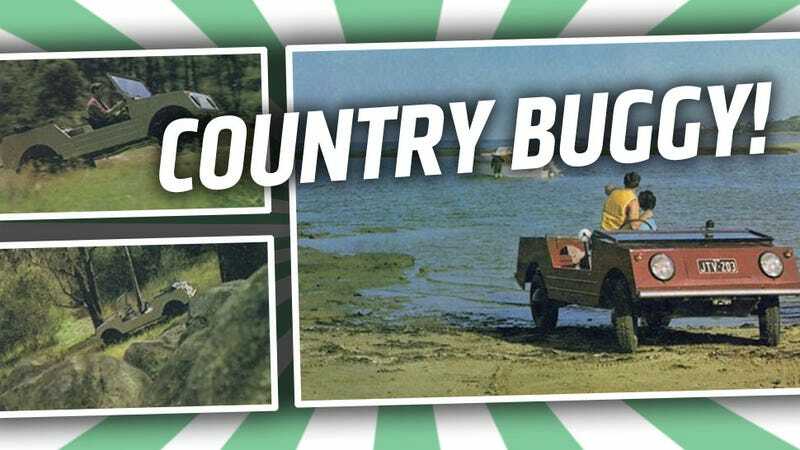 Obscure Air-Cooled VW Fetish Friday: The Country Buggy! In my continual quest to make every obscure, low-volume air-cooled VW known to all my beloved readers, I'm excited to present you one of my favorite spawns of the Beetle: The Australian Country Buggy. This thing was the Thing before the Thing was a thing. I'll explain. VW had manufacturing plants in Australia, and by the '60s, they were doing great. They primarily built Beetles and Type II buses and vans, and both were selling like hotkrauts. The Australian market wanted something a bit more rugged for use in Outback ranches or kangaroo farms or dingo orchards whatever they have out there. The Beetle had proven itself rugged and good off-road, but a more open and flexible body style was needed. VW Australia also had gotten some interest from the Australian army for a tough little general-purpose jeep-like vehicle. The army was already using VW Kombi vans, and thought VW would be an ideal supplier. In 1964, VW Australia Engineering manager, Cyril Harcourt and Quality Control Director Rudi Herzmer made some drawings for a simple, robust car based on the standard Beetle chassis. Originally, the plan was to have the car be amphibious, and as a result foam was used inside body panels of the prototypes to improve floatation. Extensive testing of prototypes with 1300cc and 1500cc engines exposed a number of places for improvement, including using VW Transporter reduction rear axles to improve traction and raise ride height. The end result was a car that looked like it had been designed with only ruler and a basic design cribbed from a 5-year-old's drawing of a car. It required no complex pressings at all, and had a very flexible open 2-seat almost-pickup truck-type layout. There was a decent-sized trunk up front, and behind the seats was a nice platform that could be used for people, cargo, a stack of koalas, or whatever. The Country Buggy used off-the-shelf hardware for lighting, instrumentation, wheels, and most trim bits, but it did manage to have some unique details, like the body-exiting exhausts. a. Side panels to be ribbed for added strength. b. All foam to be removed and additional cross members welded into side panels. Vehicle design was not to consider flotation capabilities. c. Improved spring plates to be added. b. Investment in plant and machinery equipment for the production line was limited. c. Production be maximum 1800 units per annum. d. Production could not impede existing vehicle production capacity. e. Use of maximum Australian content to satisfy Government requirements for taxation benefits. The Country Buggy was also sent as CKD kits to the Phillipines, where it was sold under the name Sakbayan, which in Tagalog roughly translates to "people's car." The Sakbayans had optional hard tops and doors, and were even used as police cars in the Philippines. A few in this role even shows up in the Pam Grier movie Black Mama, White Mama. In many ways, I actually like the Country Buggy even better than the Thing. It's even cruder, even more crazily simplified than the thing, and I think for a hard-use car like this, that's a great thing. You could replace the only glass with a simple panel you get at Home Depot, you could make passable bodywork repairs with plywood, and I bet you could have a hell of a lot of fun in one of these. There's hardly any of these left, and I doubt I'll see a real one any time soon, but this seems like a very achievable replica project to try if I ever get a bunch of time and an old Type I VW chassis. Anyway, here's to you, Country Buggy!